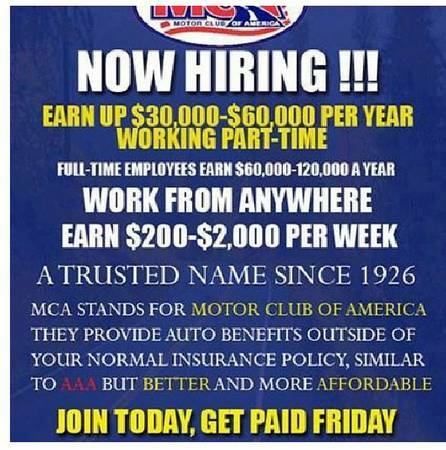 If you're seriously interested in changing your financial future with a small investment of $40 that gives you the potential to earn hundreds weekly , then MCA is a great opportunity for young entrepreneurs who are interested in earning an income away from the 9-5 . Contact me 318-617-3089 and I will show you how. Location: Tyler/East Tx Compensation: $200 - $2000 Weekly Telecommuting is ok.OK for recruiters to contact this job poster.Please do not contact job poster about other services, products or commercial interests.